A treat for Chinese learning beginners: a compact, nifty, featured-packed and free Chinese-English dictionary for Windows. 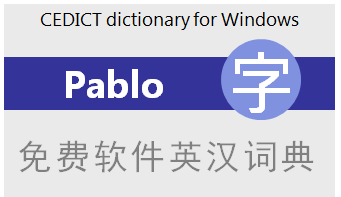 Pablo is probably the best Chinese-English dictionary alternative for beginners. Based on the acclaimed CEDICT database, over 90,000 entries. Get the installer from the Download box in the left part of the page. This is a self-extracting file that installs or updates Pablo automatically. Pablo is a one man effort. Please donate to support developments and updates. You can try out Pablo for free, but if you like it and continue using it, it is only fair to contribute a small amount, don't you think? Suggested amount is $15, any amount is welcome-- feedback from users is a treat! How to get the Chinese voice to work. You need to install the voice engine with the Microsoft Chinese voice. For step-by-step instructions, look here. Finally, if you haven't yet, be sure to check out Pingrid, a fun and effective game to train your Chinese vocabulary. Pablo is excellent. I am buying a Palm PDA. I wonder if this would work with it, allowing me to draw the characters with the pen. That would be fantastic. July 12, 2007 at 6:05 a.m.
August 6, 2007 at 8:24 p.m.
Hi, is Pablo open-source? And if so what license is it under? September 18, 2007 at 5:27 p.m.
December 21, 2007 at 4:00 a.m.
Great product! I was already a fan of Jordan K's java app, and it's great the way you extended it. I noticed your app isn't java based - did you port it to c++? January 13, 2008 at 1:32 a.m.
Good job Emmanuel... Pablo is an excellent program. How do I get the 'speak' option to function? I right click on the character then click on 'Speak' in the menu, but nothing happens. There are no included help/instructions on this too .. or did I miss something? What programming language(s) did you use to write this software? And how did you incorporate the Flash inside the program? And I'd like to ask too .. how did the name 'Pablo' come about for a Chinese language software :-D ? April 26, 2008 at 3:51 a.m.
Pablo is written in basic, using a compiler called HotBasic. The animation is also written in native basic. Regarding the "Speak" issue, I'll post a "how to" guide. April 26, 2008 at 8:27 a.m.
May 21, 2008 at 2:38 p.m.
May 21, 2008 at 8:54 p.m.
Hi, the program is very useful but is there a Multi-radical (like WWWJDIC) search? June 14, 2008 at 11:45 p.m.
"multi-radical" search is one of Pablo's greatest features. - right-click on the search box. This brings up the radical list. - now RIGHT-CLICK on the different radicals that make up the word. (No need to select ALL the character's components. Usually 2 to 4 are enough). - then go to the 'Results' tab. June 19, 2008 at 8:51 p.m. I'm currently in China and your program looks fantastic but I can't download it! Is there any way you can make it available? I think it would be a huge help in talking to my chinese colleagues. July 5, 2008 at 6:24 a.m.
Just read the preceding comments by Dan, if Emmanuel thinks it can help, I can help by hosting the file on the "Downloads" section of my site. Right now I've not done anything; let me know if you need help and let me how I can help. July 6, 2008 at 9:15 a.m. If you could host it that would be fantastic. Either that or as this program seems to be free would Emmanuel mind if you emailed it to me at DNW1710@hotmail.com? July 7, 2008 at 4:46 a.m. I agree, that would be great. The source locations of Pablo and Pingrid can be found on this blog. (I also tried to open an Xdrive account but I get no reply from them, and I'm not even sure it can be accessed from China). July 7, 2008 at 9:06 p.m. I have posted up the two files for PABLO and PINGRID in the Downloads section of my site. Emmanuel, you could take a look at that site to see whether it looks OK to you - let me know if there is anything you want to change. July 8, 2008 at 7:00 a.m. I am currently in China, and I am having great dificulty with your links for download. Is there another way I can get a copy of Pablo ?? July 8, 2008 at 6:26 p.m.
July 9, 2008 at 7:31 a.m. I am unable to access ultrabeast's site from china either. July 10, 2008 at 8:32 a.m.
great stuff, now i carry pablo in my thumb drive as a portable dictionary. are you planning to release a windows mobile version so that it can be loaded into WM phones with touch screen such as the HTC TytnII ? that will be awesome indeed. but still great stuff, appreciated your hard work. July 13, 2008 at 10:06 a.m.
for Jerry: I am sorry, at the time I have no solution for you (or for other located in China). I keep trying to find a kind of web-based storage that would be accessible in China. for ST: Unfortunately, I have no competence in Mobile programming neither the tools to do it, so Pablo will remain a desktop thing for now... Thanks for your post. July 14, 2008 at 1:00 p.m. This program is fantastic! Thank you so much for creating this. Fyi, I am in China now, and was able to download the file via Xdrive. July 30, 2008 at 10:34 a.m.
August 21, 2008 at 3:19 p.m.
Amazing program, I'm studying Chinese and use this daily, the 'Find characters based on this character' is by far my favourite feature. Otherwise stellar work, wish I could get this on my phone! I'll have to settle for DictForMIDs. August 25, 2008 at 3:38 a.m.
www.xuezhongwen.net has attributed its animated chinese animations to you. Can anyone use them for non-commercial or commercal use if they attribute them to you? If so, where can I download them? August 29, 2008 at 4:43 a.m.
August 29, 2008 at 5:32 a.m. In the meantime, why not open the drop-down "search box". That gives you access to the latest words you typed. August 31, 2008 at 11:36 a.m.
Apart from that, I reserve the rights over Pablo and the associated data. If you plan to use the data, for instance in a software of your own, please email me to discuss conditions. August 31, 2008 at 11:40 a.m.
to all: thanks for your kind words and good luck! August 31, 2008 at 11:41 a.m.
4. Download that and it will appear as "Microsoft_TTS_51_chs.msi"
4. Go to Windows Control Panel and click on the Speech icon. Change the Voice Selection from default to the newly installed one. In my case Microsoft Simplified Chinese. ** Before you close that window, click on the Audio Output button and direct the voice to the correct audio driver which might come with your sound card. 5. That's it and I hope it is helpful for some. September 11, 2008 at 5:08 a.m. Someone please email me and tell me how to use PABLO off my thumbdrive. I use a lot of public computers, so I can't install anything onto a computer directly! I have PABLO on my thumbdrive now, but when I enter an English word, or draw a Chinese character and hit the ENTER key (on key board), everything remains BLANK! October 18, 2008 at 11:05 p.m.
October 26, 2008 at 3:29 a.m.
thanks for you hardwork to make this excellent program. October 31, 2008 at 3:51 a.m.
Will there be any updates released for Pablo in the future? December 7, 2008 at 1:20 a.m. Yes! There are regular updates for new features or bug fixes, and also to update the word and stroke databases. December 7, 2008 at 1:34 p.m.
March 1, 2009 at 11:21 p.m.
Looks good, but I was looking for a dictionary that has radical/strokes lookup. Did I miss something? Thanks for giving the link to DimSum: it does the job for me, but I am always looking for a better mouse-trap. April 29, 2009 at 8:30 p.m. Yes, Pablo does have radical/strokes lookup. The magic click: RIGHT-CLICK in the Search field. That will bring up the radical list! In addition, Pablo has an exclusive feature, MULTI-RADICAL search: find a character from its components, even if you don't know which one is the radical. (more details in the help). May 2, 2009 at 5:43 p.m.
Great, I had not seen this feature. I will try it out. It seems to work the way I want it, but I need to get more familiar with it. Being able to look up radicals/strokes makes all the difference. Thank you very much. May 5, 2009 at 1:37 a.m.
1.could you add support so that the definitions tell whether they are noun verb adjective etc..
2.add the ability to add a mp3 audio file to each definition, and once you add the audio file you can have a play audio icon to click on that has the option to play one time or play in a loop with a 3 sec. interval after the audio finishes. 3.i don't know if it does or not but can we add our own custom words to the dictionary, if not this would be a cool function to edit the dictionary. June 2, 2009 at 1:20 a.m. So far it does not contain information about the word type (if is a noun, a verb, etc.) Adding that information would be a huge work. I asked the owners at mdbg and for now they have no plans to include that. As for adding personalized words, that is possible: go to the mdbg.net website and you can edit the CEDICT. In the next release, I plan to add an "auto-update" feature to Pablo so that you can get the latest CEDICT database easily at any time. Regarding question 2 (adding mp3), I do not plan to do that since a lighter alternative exists: if you are interested in having the words pronounced, I recommend you install speech synthesis on your PC with a Chinese voice and then use Pablo's Speak command. Adding individual mp3 files would require much work and an awful lot of memory space. Details on how to install a Chinese voice are given in another post. June 4, 2009 at 10:11 a.m. I would like to change the hotkey from F10 to F12, is that possible? Also the ability to alt-click on a word would be cool. June 14, 2009 at 9:06 a.m. Version 2.0 has a new Options screen, where you can change the F10 shortcut! September 19, 2009 at 4:01 p.m.
November 10, 2009 at 1:28 a.m.
November 10, 2009 at 9:19 p.m.
November 11, 2009 at 5:43 a.m.
Is Pablo portable? Can I just copy the folder from Program Files onto a USB drive and run it off that on other machines? November 16, 2009 at 4:22 p.m.
David why not just try? I think the answer is probably yes. Just don't forget to download the libraries before you copy the files over to your USB drive. Another question: Every time I start Pablo I make it full screen and set the search mode to 'Anywhere', but the program never seems to remember these settings. Any way to make it remember? Awesome program, it's been a mainstay in my Chinese learning. Best features are F10 and 'Find Characters based on this character'. Brilliant work! Thanks so much. November 17, 2009 at 6:17 a.m.
November 17, 2009 at 6:22 p.m.
nice suggestion, I will think of it. By the way, since the 'Favorite words' feature, I too usually set the default to Anywhere: I have marked as favorite all the words I (should) know, and therefore they appear first when I make a search. November 17, 2009 at 6:40 p.m. I also like how Pablo uses the stock CC-CEdict from mdbg. I also like the different ways of searching for the words including pin yin, english, and character entry by handwriting recognition. The animation, and the extra information for each character is a great bonus. Thanks for this great dictionary. The multiple radical lookup is awesome. Could hybrid lookups of mixed characters and pinyin (aka Pleco) or mixed pinyin and english be incorporated? Is there a way of updating the CCCEdict from within Pablo? November 19, 2009 at 8:19 a.m. I do agree, multiple radical lookup is awesome, I use it all the time. For users who may not be familiar with it: PLEASE have a look at the demo in the help file, you are sure to like it. Updating the CEDICT from within Pablo: YES, go to the Options screen by clicking the small brown triangle, and go to the Updates tab! November 19, 2009 at 8:23 a.m.
December 22, 2009 at 1:37 a.m.
Pablo is pure awesomeness :) Totally worth paying for! Is it possible to make it minimize to Task Bar and still have it run as usual? I use WordPad in Windows quite often. can it be written to activate in WordPad also? April 19, 2010 at 10:26 a.m. I write down the idea of minimizing to task bar. Why not. I understand that the goal is to free some space in the Programs bar, right? As for WordPad: yes, popups work with it. You have to open Pablo's Options screen, go to the "Popup" tab and add wordpad.exe to the list of supported programs. April 19, 2010 at 11:06 a.m. I tried but still couldn't get Pablo to work in WordPad by adding wordpad.exe into the Popups list. There is something else that needs to be done here? As well, I thought of another useful addition to the search could be to correlate numbers with the phonetic sounds. Say, I could narrow my search by typing shang4 hai3 to get 上海 or shang1 hai4 to get 伤害. Or just leave it without the numbers and get all the phonetic possibilities in the search result. April 25, 2010 at 10:50 a.m.
To Jack Wan: sorry for Wordpad, on my computer it worked just fine (after restarting Pablo and Wordpad). April 25, 2010 at 7:24 p.m. I am using vista. I cannot get pingrid to install. It keeps saying that it is " trying to install check_for_updates but cannot create this file. May 16, 2010 at 1:14 p.m. Thanks very much for Pable and Pingrid. Just wondering, does Pingrid recognize wordlist with traditional characters ? May 17, 2010 at 4:18 a.m.
May 18, 2010 at 9:10 a.m.
May 18, 2010 at 6:45 p.m. Excellent program but my characters are showing up as blank boxes. What did I do wrong or is there something else I needed to install? June 4, 2010 at 7:50 p.m.
- best appearance is obtained with the "Arial Unicode MS" font (it is a standard font, that you can get with microsoft office, for example. June 4, 2010 at 8:50 p.m. Thanks Emmanuel. I think you're right but I need to dig out my Windows Installation disk to change the regional and language settings. June 4, 2010 at 11:18 p.m. Many thanks to Emmanuel for Pablo. I relly like this software, especialy the "writing pad" feature as it makes chinese character recognition very easy. I wonder if you have plans to release version of pablo for smartphones. the "writing pad" will be very useful with touch-screen mobiles if Pablo is available on smartphones. i belive features currently available woth Pablo have great potential for mobile phone use. Thanks again for such a great software. June 9, 2010 at 6:47 p.m. I have used Pablo on other computers before and am trying to download it to my new laptop, but where the download button is supposed to be, there is just a blank white space. I've tried both with firefox and IE. Does anyone know what might be causing this? Thanks. June 12, 2010 at 4:56 p.m.
Could it have to do with Flash? The page relies on it to display the download box. June 12, 2010 at 9:12 p.m. I've tried both the link and updating my flash. Neither seem to work. My browswer won't even allow the site to load. I'll keep trying, but do you have any other advice? Thanks. I love this app! June 18, 2010 at 5:28 p.m.
Aaron you need scripting turned on(turn off java script blocker) and flash installed(best to update to flash 10.1 to avoid the security problems in earlier versions). Is there any way to enable the popups for web browsers ? And is there anyway to hide the writing pad when I don't need it ? June 20, 2010 at 7:56 a.m.
and your Pingrid do the job perfectly! I have no word to describe your wonderful job, you deserve to stay among the best software applications for learning chinese (pleco, rosetta stone, wenlin, skritter etc...) thanks from Italy! November 11, 2010 at 10:17 p.m. Thanks for take it in consideration! December 17, 2010 at 3:28 p.m. I am sorry, iphone programming is completely out of my range. Remember, this is only an amateur effort! December 17, 2010 at 3:33 p.m.
You can use Pablo also with the German HanDeDict dictionary. You have to do 3 things taking for instance the file "handedict_nb.u8"
After starting the application Pablo will recognise a new dictionary and take 1 minute or 2 to install it properly. January 6, 2011 at 12:45 p.m. I like the idea of compatibility with HanDeDict. Would you like to be a tester for an updated version of Pablo supporting it? January 10, 2011 at 5:32 p.m.
for German users: give a try to new version 2.5, it adds support for HanDeDict- just copy the HanDeDict dictionary file! February 5, 2011 at 12:43 p.m. I like the thinking behind the new search functionality. I may have a found a bug for you. Try searching for 的人. February 12, 2011 at 11:35 a.m.
are this need a : .Net framework? February 19, 2011 at 7:40 a.m.
no .net is needed, neither is java. Pablo is a standalone program. February 19, 2011 at 9:04 a.m. I am very happy that you like Pablo. About the search for 的人, the bug is now solved. March 11, 2011 at 9:50 a.m. I just downloaded Pablo and it seems to be an useful program. Thanks so much! I was just wondering if Pablo would allow me add the characeters I learned in so I can create my own word bank and also allow me review them? Thanks for your time. March 21, 2011 at 7:58 p.m.
March 21, 2011 at 10:33 p.m.
Pablo seems to work fine on my computer (I haven't had a chance to use it yet), but I have a problem getting the cedict into the program. I've tried manually downloading the cedict dictionary from mdbg, but the data subfolder won't allow me to save the cedict file in it, and says I "need to get permission from the author/creator"! When I've tried to automatically download the dictionary through the Pablo program, I get an error message, and the file doesn't download. Am I not supposed to save the dictionary zip file in Pablo's data folder? May 24, 2011 at 8:27 a.m.
Maybe the download process has been interupted and some open process impedes updating the dictionary file. When you restart your computer, try again updating CEDICT from Pablo (in the Options screen). If you want to do it manually, you have to copy the file cedict_ts.u8 into Pablo's 'data' subdirectory. May 25, 2011 at 8:32 a.m. I cannot get the word input facility to work. When the cursor is focussed on the search field, the program recognises a right click, or space bar, but will not accept the ENTER key. I'm using XP SP3. Any known problems. The Pingrid application has installed correctly and shows up on the start menu whereas Pablo is not on the menu. May 27, 2011 at 5:33 p.m.
Click on the small brown triangle to open the Options window, go to 'Pablo updates'. In the CEDICT section, click the Download button. May 29, 2011 at 8:26 p.m.
On that webpage you can initially only download the Pablo.exe file. That doesn't work due to Box.Net Security Restrictions. The way to do it is: click on the Pablo.exe file to download it, wait a bit, clcik on the back button in your browser. Now you will see you can also download the zip-files. Good luck. Note: I had this problem downloading Pablo 2.5c, but now with the newer version, the same link also allows you to download Pablo 2.6c. June 3, 2011 at 9:45 a.m. Your programs (both Pablo and Pingrid) are fantastic. I've been struggling to learn Chinese for years and now I feel I'm finally starting to consolidate some of the progress. September 21, 2011 at 5:25 a.m.
December 7, 2011 at 11:57 a.m.
i just downloaded pablo but can't figure out how to work the popup in firefox. nothing will pop up. I　changed the shortcut keys even and it didn't work. please help :-). I can't wait to use pablo to the fullest extent. i love your work! June 4, 2012 at 8:26 a.m. Unfortunately popup definitions are a strange beast and they are far from perfect. Actually they only work well under Windows XP. Under other systems, I recommend turning them off (Options screen >> Popup definitions tab). November 10, 2012 at 11:20 a.m.
the pop up function doesn't work in windows 8 could you help me out on this? November 23, 2012 at 9:09 a.m.
Are there any plans to provide PABLO for Android or Mac platforms??? I have it installed and working in my PC's but I also have an Android smartphone as well as Mac. December 18, 2012 at 9:06 a.m.
Dear Sanchezantonj, I am sorry, there are no plans for other systems than Windows... they are simply beyond my humble programming skills. January 9, 2013 at 4:32 p.m.
March 28, 2013 at 6:33 a.m. Indeed, Asian characters must be enabled on your system (that is done in the control panel called "Regional configuration" or "Languages"). I hop you'll like Pablo. March 28, 2013 at 8:25 a.m.
April 6, 2013 at 8:01 a.m.
You will have to run this utility again to completely install Pingrid version 3.4b. May 9, 2015 at 3:13 a.m.
Hi, Emmanuel. I really love your dictionary. It is simple, yet very effective. It helped me so much in my Chinese learning and I appreciate it so much. August 18, 2016 at 3:02 p.m.
March 29, 2019 at 1:30 p.m.